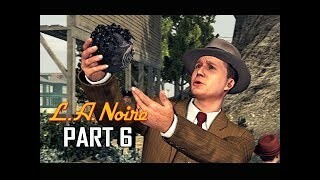 LA NOIRE Walkthrough! Walkthrough and Let’s Play Playthrough of LA NOIRE with Live Gameplay and Commentary in 4k ULTRA high definition at 60 fps. This LA NOIRE walkthrough will be completed showcasing every level, mission, boss, and story ending. The game takes place in the city of Los Angeles, in the year 1947, with the player assuming the role of Los Angeles Police Department officer, and later detective, Cole Phelps. The game starts with Phelps as a uniformed patrolman, and follows his career as he advances through the police department bureaus (desks) of Traffic, Homicide, Vice and Arson. Each desk gives the player a new partner who will help Phelps in his investigation of a number of cases based on a specific type of crime. The game assigns the player with cases that they must solve. After each case, players receive a rating of 1–5 stars depending on their performance in both interrogations and searching for clues.